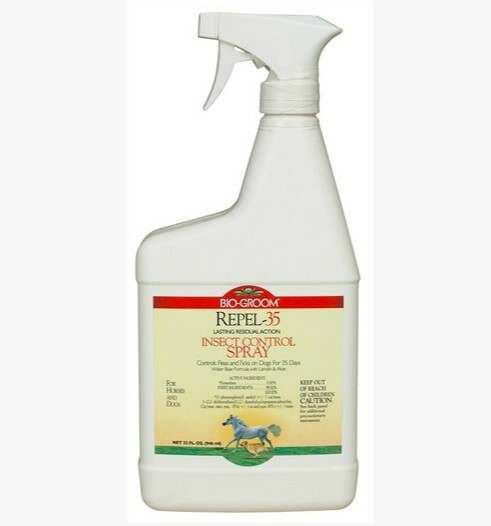 PRODUCT DESCRIPTION: Water based spray for use on dogs, cats, horses, which will control fleas, ticks, flies, lice and other biting insects for 1-2 weeks. It uses permethrin as the active ingredient and can be used as often as needed. WHERE TO USE IT: Directly on the animal. RATE OF APPLICATION: As much as is needed to get good coverage. RELATED PRODUCTS FOR THE PET: FLEA COMB OXY MED ITCH RELIEF SPRAY MELALEUCA SHAMPOO PETCOR (alcohol based – strongest pet spray available – KILLS FLEA EGGS!!) TRIPLE PYRETHRIN PET SHAMPOO (great smelling and very effective) FLEA DIP CONCENTRATE FLEA POWDER (for treating dogs and cats).